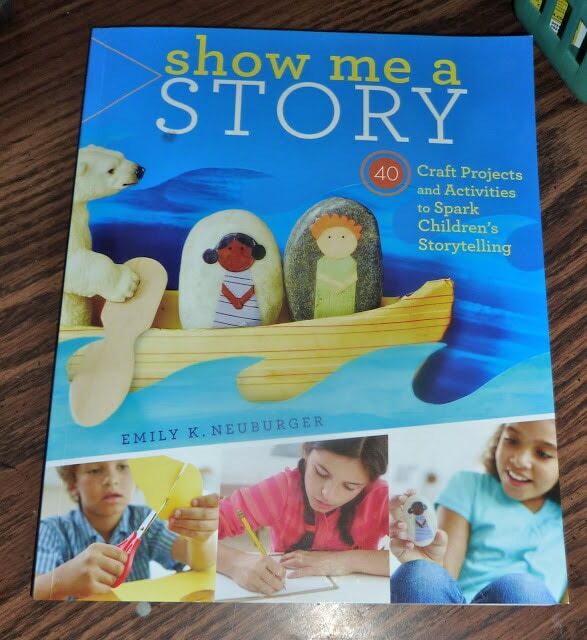 We were asked to help review and share a wonderful new book Show Me A Story, this new book was just released on 8/13/2012. Even with it just being released it has already won the Dr Toy award for 2012. 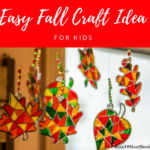 It was written by a mother of 2 girls looking to share ways to help parents begin, develop and play with story telling using craft projects and activities. Show me a story starts with a preface from the Author, Emily where she shares about her childhood, and how when she was young she would explore imaginary places, as she got older the everyday things in life made he leave those imaginary places behind. When she was in her final years of College she was reintroduced to her imaginary places when her college professor challenged the students with unique and creative writing assignments, poems, and journaling. Because of the encouragement from her college professor, when Emily became a mother she was overjoyed to help spark the creativity of her 2 little girls and has special places made for her girls to work on art, story sparks, and teaches them and other students to listen to their own creative voices. Helping both children and adults go to imaginary places or pretend they are imaginary people such as queens, dragons, and imaginary villages. After the preface there is an introduction where Emily explains that every child has the ability to dream, all they need is a little boost from those around them, how story telling is the most wonderful food for growing minds, how open ended play is a great way to spark creativity, and also includes a wonderful list of open ended play activities to try with your child. The introduction also explains in detail how stories are good for not only children but the adults around them as well, it talks about how to be inspired by taking the time out to enjoy the world around you, and includes a section that tells parents how to use this book, explaining that we should follow the child’s natural inclinations and excitement and going onto explaining what to expect from your child and answers many of the questions that may come up while doing some of the activities with your child. Story Play: All the brainstorming, story starting, and story telling come to life. The back of the book lists materials suggested for children to have available to them. It shares some great online stores to find materials from at a great price, includes a list with some storage tips for ideas on storing all your fun projects! Finally there are templates of badges, dinosaurs, puppets, and a large puppet theater background for you to use with your children for all kind of fun learning! 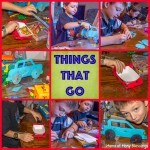 I have to say this book has exceeded my expectations, the activities are things that are simple to put together using items most people already have around the house. The activities have been engaging and fun for the kids to do and has even gotten the older kids to join in on the fun! The quality of the book is just wonderful!! I have really found this book to be an amazing resource, one I will continue to use regularly! Below are a couple of the pages in the book, the book is full of beautiful full color pictures of the projects which really helps show children the end results! 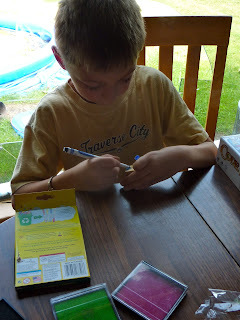 One of the activities that we did from the book to start with was creating story dice. 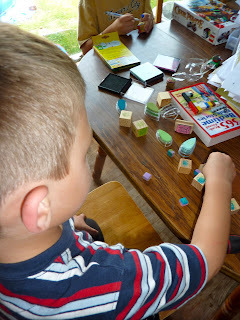 I got together some of our wooden cubes, stamps, stamp pads, think markers, colored pencils, and the Show Me A Story book for examples. The kids were told to make a picture on each of the sides of their cubes either drawing them, or using the stamps and then coloring them in. 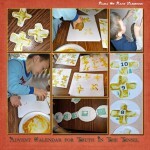 They all enjoyed doing this and came up with some creative ideas! 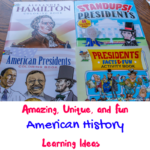 The book gives you lots of examples to help the kids get thinking of ideas as to what they want to add to their “story cubes” and was very helpful. We have had so much fun using our story dice to come up with some wonderful and fun stories!! I would recommend Show Me A Story to anyone with children, it is such a great waty to spark children’s imaginations and storytelling abilities and would be a wonderful addition to anyone who spends time with children’s library parents, teachers, aunts, uncles, grandparents, camp councelors, I also think it would be a great gift for any parent to receive. 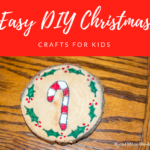 We will continue to use this book regularly, as we dive in further into the kid’s creativity using the different craft projects and activities from this book. Stop over to the Storey Blog and see the other bloggers participating in the blog blast. 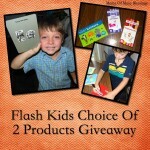 Also get entered to win a second chance giveaway on their blog. In celebration of the release of the new Show Me A Story Book, Storey Publishing is offering a giveaway for one of my lucky viewers for your own copy of Show Me A Story. 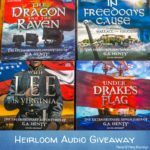 Enter to win using the Rafflecopter linky below!! 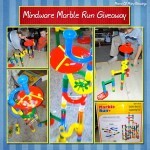 This giveaway will be open to all US Residents and will end 10/3/2012 at 12:01am EST. I am linked up to the following giveaway linky parties. Stop over and check out all the great giveaways listed here!! Disclaimer: I was provided with a copy of Show Me A Story and a copy for a giveaway at no cost to me in return for my honest opinion of the product. All opinions are the honest opinions of myself and my children. This book looks awesome.Thanks for a chance to win it. My favorite story is usually whatever we’re reading 🙂 Right now it is The Hobbit… so good!